As we enter March, the weather seems to be getting better which means that I can save some money by switching off the otherwise ever blowing heater in my drawing room and can exchange my over-sized woolen coat with a lighter spring jacket. Mind you, we are far away from colorful blossoms but even few sun rays that pierce through the dark grey skies and bounce off the streets of London can totally transform the picture. The streets are filled with runners burning their carbs in their shorts, families crowding the parks and other people trying to soak some Vitamin D.
On one such supposedly fine weather day, we decided to drive up to Polsden Lacy near Dorking. The drive, as we moved out of London, was very scenic. Living in London makes your eyes so used to the concrete and glass buildings that even small pastures of green surface are mechanically recorded as beautiful scenery in a normal human brain. The drive was just over an hour and we being typical Indians were as expected late to the party. The car park was full of people who probably would have reached there a good three hours before us while we were stuffing ourselves with poha and tea at home. Polsden Lacey is an Edwardian house which belonged to Margaret Greville who was a well-known Edwardian hostess of her times and with her fine collection of paintings, furniture, porcelain and silver, the house was a party house for all the summer gatherings that she hosted for the elite including the royalty. So, nothing really historic about it apart from the fact that the Duke and Duchess of York spent two weeks of their honeymoon in that house and later was used to house officers during World War I. As all touristy places, they have tried to bring in some spicy stories of how Margaret was an illegitimate child of a millionaire and her rags to riches story terming her as modern day Cinderella. I personally found the house quite average but the greenery and the views outside were beautiful. There are extensive grounds as the estate is totally 1400 acres and has beautiful walking paths in the estate. 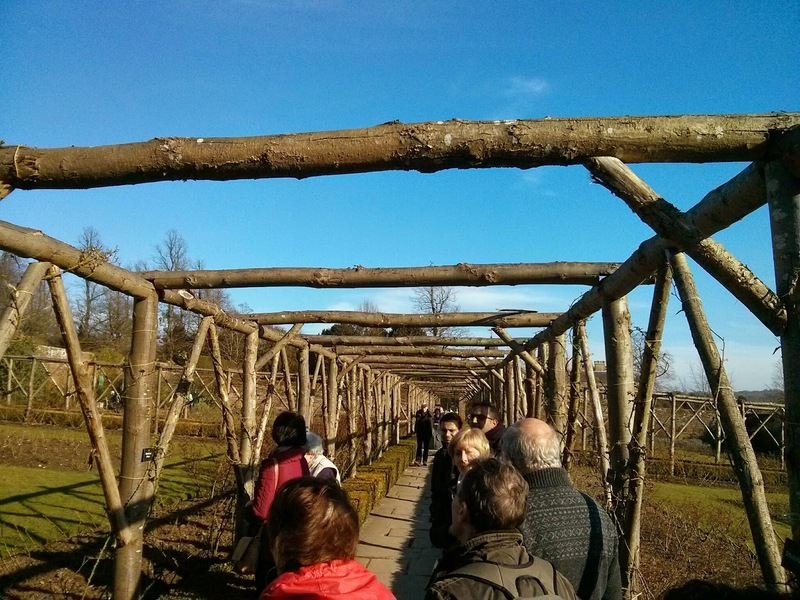 The formal garden tour that we took challenged our imaginations to the limits. “There in that corner stands the most beautiful peach rose shrub”, we turned around and saw a dry twig hanging from a withered bark. There were many more moments like this in our one hour walking tour as we passed through vegetable garden, rock garden, royal arch, walled garden and so on. I guess we were there at the wrong time of the year. The tour ended at burial ground of her 21 dogs, each named and curried with a special plate. The highlight of the property was the enormous slope in front of the house. 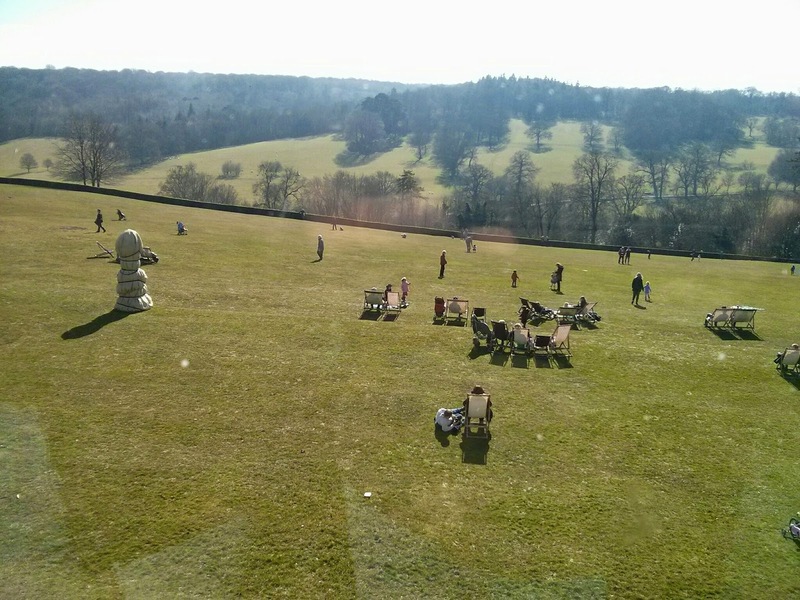 As we settled there to relax and enjoy the view, we saw lot of small children having a great time rolling down the slope. Apparently the team at Polsden have a Guinness World Records for the most number of people to roll down a hill in one hour. On the slope were big and small, old and young, all sorts of visitors and as expected none of them were Indians. We Indians hardly reach to such places as most of the touristy time is spent at Madame Tussauds wax museum taking photographs with Amitabh Bacchan. Anyways, coming back to the point, not only were we the only people with Indian passport, but also the only ones who were totally unprepared for a nice outing at Polsden. Everyone and I mean everyone was there with a large picnic basket, garden mats and books. We had none of this. 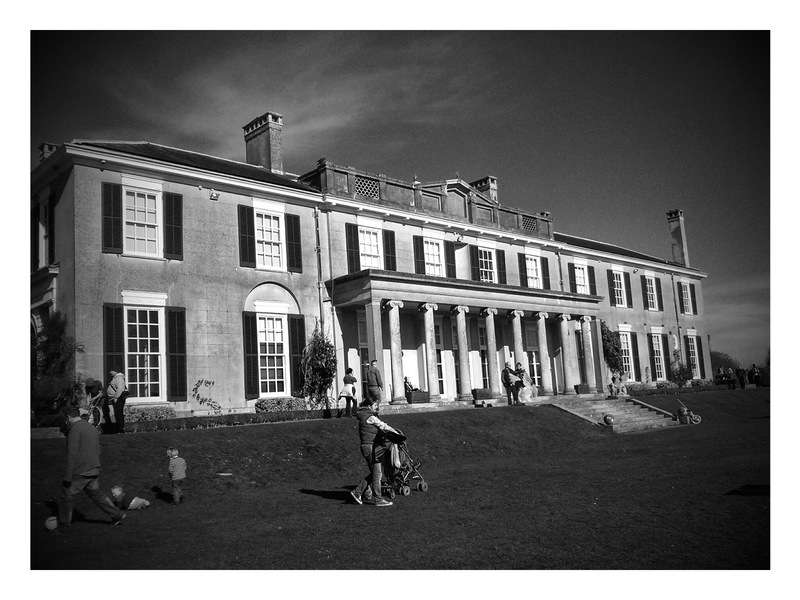 Overall, I have to say that we have to thank the Greville family for donating such a huge property to National Trust. Not sure if this true, but the story goes that the royal family was expecting this house to be given to them and were not happy when this went to the National Trust. However, all her precious jewellery and a very beautiful tiara were ‘gifted’ to the royal family as per her will. Well, all I can say is what a wonderful ‘gift’ to give, just like the koh-i-noor.